Boqueria is a lively tapas bar in NYC & DC, inspired by the buzzy atmosphere and great food of the Barcelona “Kioskos” that surround the renowned food market “El Mercado de la Boqueria” such as the famed Bar Pinotxo. At Boqueria, the open kitchens—helmed by Executive Chef Marc Vidal—turn out tempting versions of classic Spanish tapas and small plates inspired by the season’s best products. Designed for easy sharing, favorites include Pan con Tomate: an iconic Catalan dish of grilled stirato bread rubbed with tomato, garlic and olive oil; Pulpo a la Plancha: grilled octopus with fennel, smoked pimentón and Picual olive oil mashed potatoes; and Paella de Mariscos: bomba rice, monkfish, sepia, squid, shrimp, clams, mussels, saffron and salsa verde. With deep roots in New York City and Washington D.C. neighborhoods, Boqueria has become a go-to destination for friends, family and co-workers to connect over the sharing spirit of tapas and Spanish food. Boqueria’s kitchens, directed by Barcelona native Marc Vidal, offer a range of deceptively simple yet memorable tapas, paella, Spanish cheese and charcuterie, and a rotating selection of dishes inspired by local farmers markets and purveyors. The dessert menu presents an array of fun and creative Spanish churros, including classic churros dusted with cinnamon sugar and served with thick hot chocolate; stuffed churros with various fillings from Nutella to dulce de leche; and a playful churro creation selection that includes Churro S’Mores, a Churro Ice Cream Sandwich, and Churro Ice Cream Sundae. Led by beverage director Kieran Chavez, Boqueria’s beverage menu celebrates the wines, beers and spirits of Spain while highlighting the country’s rich drinking history and traditions. An all-Spanish wine list showcases the various regions and varietals of the country, as well as both Spanish and local beers. Signature Sangrías are offered by the glass and pitcher in three classic selections of red, white, and rosé, as well as seasonal selections such as the Sangría de Naranja Sanguina with blood orange, tequila, cava, and lime cordial; and Sangría de Peras with white wine, vodka, pear, spiced Demerara and a cava float. Chef Marc Vidal fell in love with cooking at the age of nine when his mom put him to work at Bar Roca, the family restaurant in Barcelona where his grandmother ran the kitchen. The menu changed daily, but the simplicity and attention to quality ingredients was a constant in every dish, from a simple green salad to the Thursday paella that locals would line up for in front of the restaurant’s tiny façade. As his grandmother gave him more responsibility, washing dishes turned into pulling espresso and prepping bread pudding. Eventually, Marc was learning each traditional family recipe and the stories behind the food of his culture. These deep personal roots inspired him to enroll in culinary school at age sixteen, where he was the youngest in his class. 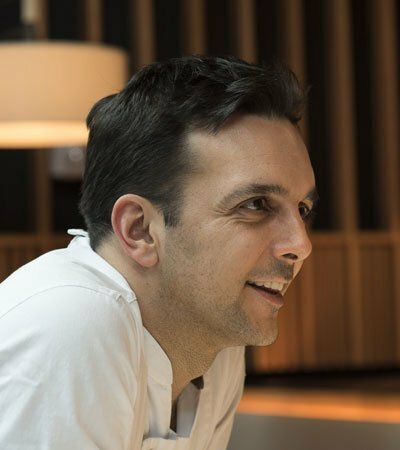 In the years after graduation, Marc expanded his Spanish culinary knowledge by working with some of the world’s leading Spanish chefs including Chef Ferran Adrià at the famed El Bulli, Chef Alain Passard at the three Michelin star restaurant L’Arpege, and Chef Alain Ducasse in Paris, among others. Invigorated by the prospect of building a menu of Catalan classics for a fresh audience, Marc ultimately moved to the U.S. where he was given the opportunity to open Solea in the W South Beach, earning the restaurant a James Beard Foundation semi-finalist nomination for Best New Restaurant. During a trip New York City, Chef Marc first visited Boqueria and it struck him immediately. From the music to the lighting and energy of the chefs in the open kitchens, he felt he had finally found a restaurant in the States that captured the energy of Barcelona’s tapas bars. For the past eight years, Marc has brought his wealth of experience, culinary talent and passion for the cuisine of his homeland to the kitchen and menus at Boqueria. Born and raised in France, Yann’s earliest memories of Spain are of his childhood summers spent with his family shopping in Barcelona’s local food markets. Ultimately drawn to the country’s warmth and spirit of hospitality, Yann returned to Spain as a student, where he expanded both his palate and passion for Spanish food culture; frequenting every tapas bar he could find (or afford!). He was entranced by the energy of these tapas bars—the informality of sampling deceptively simple yet memorable dishes, and staying or leaving whenever the spirit moved him. Eating like this was fun in a way that a “regular” meal never was. Years of working as a Marketing Executive for global brands including Perrier, L’Oréal and Allied Domecq nursed a longstanding ambition to become an entrepreneur himself – to create a company and a culture that he could be proud of. He would often meet up with friends after work, and together they would envision opening up their own restaurant; the kind of place that they would want to frequent in the city. He had never come across a space in NYC that could match the casual yet buzzing atmosphere and convivial style of eating that he had experienced in tapas bars during his time in Spain. Realizing the opportunity to create something significant – Yann embraced his entrepreneurial spirit, love affair with Spain, and passion for design in 2006, when he opened Boqueria’s flagship restaurant in NYC’s Flatiron neighborhood. Twelve years later, Boqueria has become a New York City and Washington, D.C. institution. Born from a love of connecting people over incredible Spanish tapas in a modern, lively atmosphere – Boqueria has created a culture that brings people together. It is a place where you can bring anyone, any group, any time. Our locations offer a variety of spaces for celebrations and gatherings including: tables for group dining; an elevated space for groups of up to 30 guest overlooking the lively bar scene at Boqueria Dupont; a private dining room that shares the edge of the kitchen counter at Boqueria West 40th, allowing interaction between the diners and chefs for demonstrations and cooking classes; and an enclosed dining space for up to 18 guest at our newest location in Penn Quarter (opening early 2019) outfitted with a large custom oak dining table, statement lighting and seamlessly integrated technology including a concealed flat screen TV. For those wishing to bring a taste of Barcelona into their own homes, Boqueria provides catering ranging from platters of tapas delivered, ready to serve, to full-service catering complete with on-site chefs and servers available in NYC & DC. Inside Boqueria the experience is buzzing, resembling Spain’s renowned food market “El Mercado de la Boqueria”. There are plates on plates of tapas, streaming from the open kitchen lead by Executive Chef Marc Vidal, delivered to the tables surrounded by chatters and clinks in the vibrant room. Vidal spent most of his career cooking traditional Spanish food, but also put in time at El Bulli, L’Arpege, and Alain Ducasse – real temples of gastronomy. Spain, along with Italy, France and China, is one of those countries you speak of in hushed, respectful tones when you speak of its cuisine. Boqueria does this legacy justice. Named after the iconic and colorful Barcelona food market, Boqueria serves up tapas, both traditional, and with its own twist. The place is packed most times but you can always squeeze in while you’re waiting for a table or a seat at the bar. Try anything here. It is all good. And the wine pairings only serve to enhance the experience.